Yes, you read that right: base cards. That means that there are short prints, which I will gripe about in a moment. 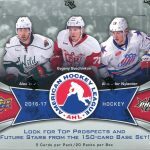 This year’s AHL set, like previous AHL sets by Upper Deck, have a foil-free front. I am OK with the lack of shiny silver stuff, because I usually find those elements distracting, and they never scan too well either. The team name, team logo, player name and position are all neatly tucked at the bottom, which really keeps your eyes focused on the photograph. 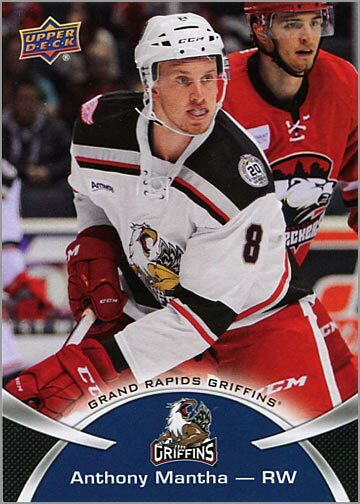 Card backs have the usual stuff (height, weight, shoots, birth date and birthplace) as well as their stats from the 2014-15 season, and the player’s totals from whatever league they played in last season (AHL, college or junior). There is also a short biography about the player. Cards 1 – 100 are the “base cards.” I got 64 of base cards without any doubles. 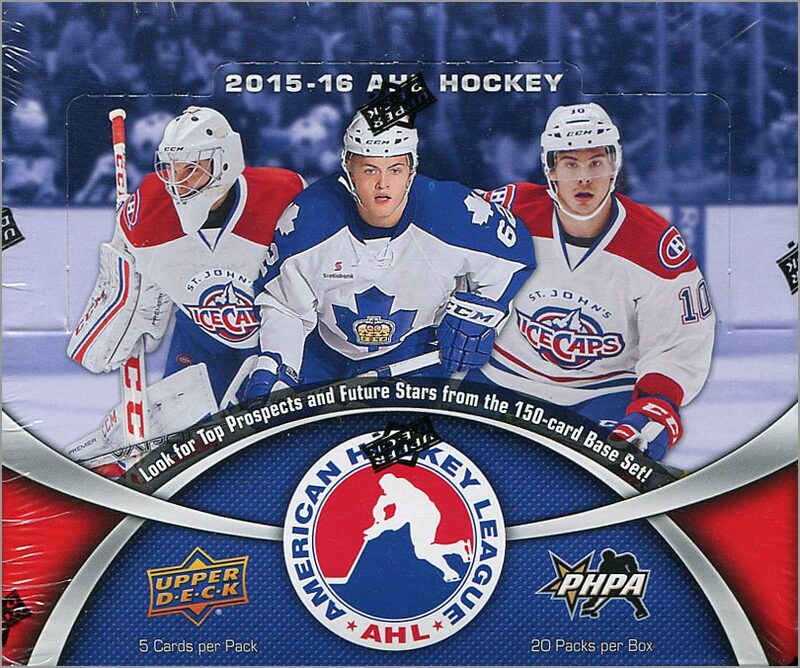 My biggest problem with 2015-16 Upper Deck AHL cards is the one-per-pack short prints. 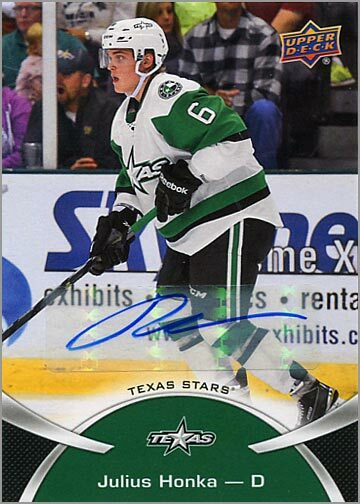 Face it: minor league cards are a tough sell, as there is zero chance of pulling a Connor McDavid rookie card or a Sidney Crosby autograph. That said, the set should be easy to put together, but cards 101 to 150 are found only one per pack, meaning that you’d still need to buy three boxes of these cards for any hope of completing the 150-card set. Granted, you’d have to buy at least two boxes, if not three, anyway. But what this does is create two different tiers of cards in this set, which is really unnecessary. 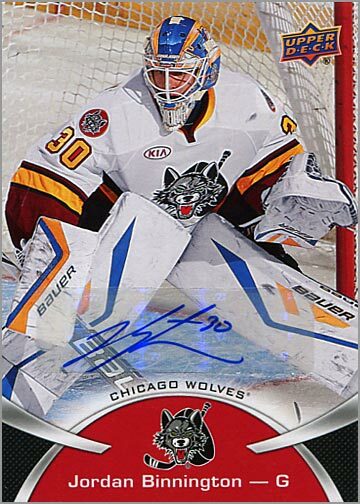 AHL cards are a tough sell as-is; short-printing 1/3 of the set is probably a turn-off to collectors who were on the fence, but decided that it’s not worth putting in that high of a level of effort to complete what is basically a prospects set. However, one big upside is that you get a lot of autographs in a box. 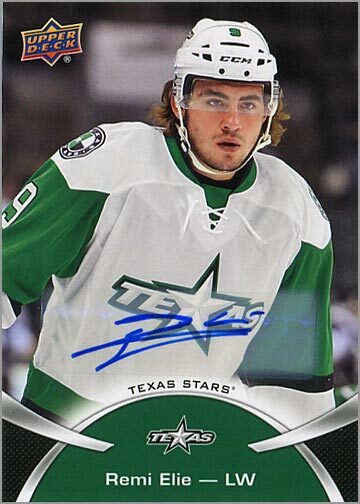 Each box of 2015-16 Upper Deck AHL is supposed to yield five autographed cards — one in every four packs — but I managed to pull six auto’d cards. 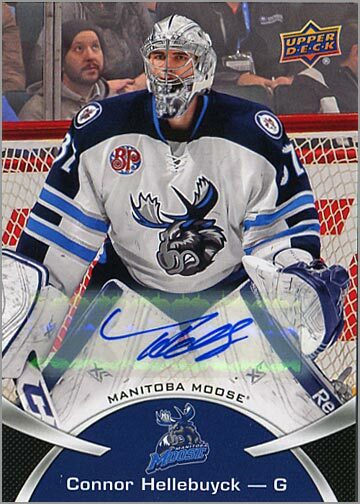 The cards are signed in blue on a shiny sticker which is then affixed to the front of the card. 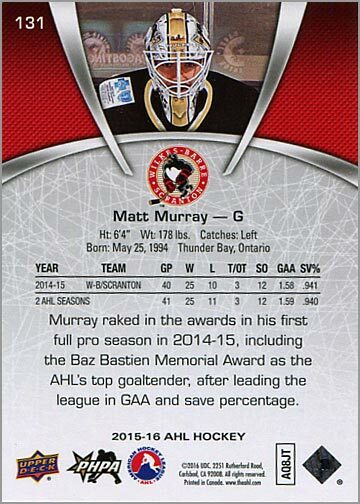 The back of the autographed cards replaces the biography paragraph with the usual “Congratulations” message typically found on the back of autographed or game-used cards. Team logo temporary tattoos? Great if you are a ten year old, but not so fun if you are much (much) older than that. If you are not a kid, these aren’t really useful. And if you are an adult collector, well, what’s the fun in collecting backwards logos? 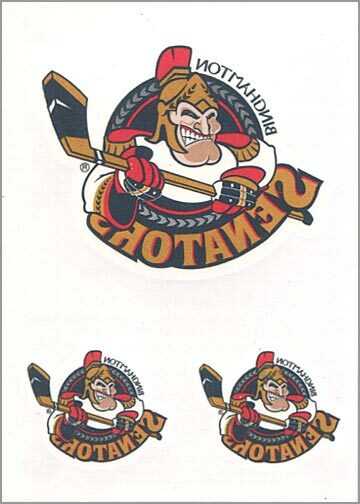 Upper Deck also included a set of five different Upper Deck logo temporary tattoos. How thoughtful. 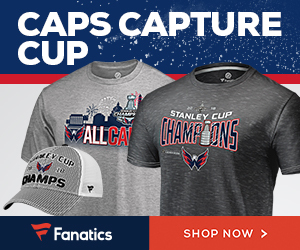 I guess if you want to display the history of the Upper Deck logo on your, uh, shoulder, then you could do so. 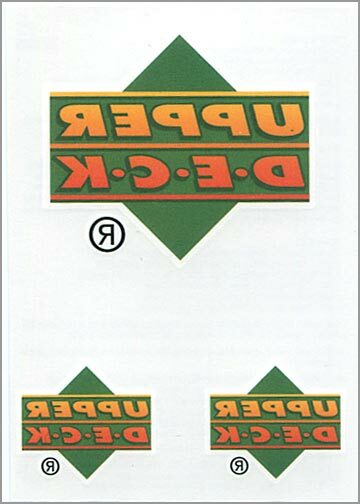 The only Upper Deck tattoos I got in my box were of the classic logo from 1989. While this year’s AHL set does have team stickers, they are of either the team’s “wordmark” — the specific way they write the team name — or the team’s secondary logo usually worn on the shoulder of the team jersey. 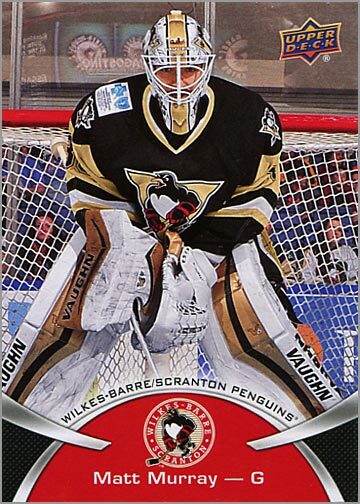 Had these stickers been of the primary logo, this would have been a simple, yet awesome, insert set to build. 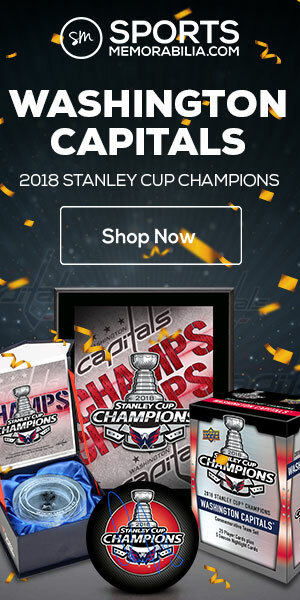 So Upper Deck put Upper Deck logo stickers in an Upper Deck card product. How…Upper Deck of them. Five different stickers show how the Upper Deck logo has evolved over the past 25 years. This may be the most unintentionally narcissistic insert set ever released. 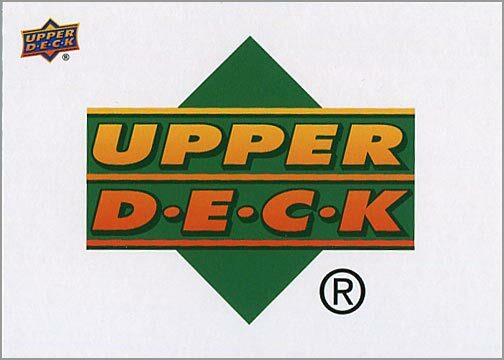 I like the way these Upper Deck logo stickers have the small Upper Deck logo in the upper left corner, in case you had any doubts as to who made this sticker. 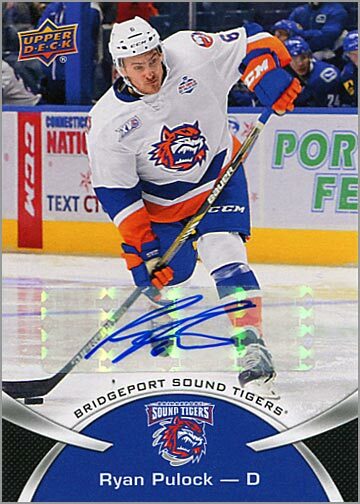 What I like about 2015-16 Upper Deck AHL: It is a set of future prospects, and I find it fun to have cards of players before they make it to the NHL. The cards have a nice, almost early 1990’s, design. Five autographs per box — or six, as in my box, is very impressive, especially since some of these guys are going to make it in the NHL. The temporary tattoos and wordmark stickers are mediocre, but at least they give the set a little variety. 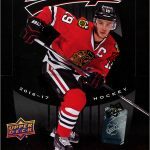 What I don’t like about 2015-16 Upper Deck AHL: Short-printing 50 of the 150 cards — 1/3 of the entire set! — makes this year’s AHL set harder to complete than it really should be. The tattoos are silly, the stickers would have been better if they featured the primary logo and the Upper Deck stickers and temporary tattoos are unnecessary. Great break Sal, thanks for posting. I like that the cards have no foil. I never seem to find packs of this stuff, do you know if this year’s set is hobby exclusive again? 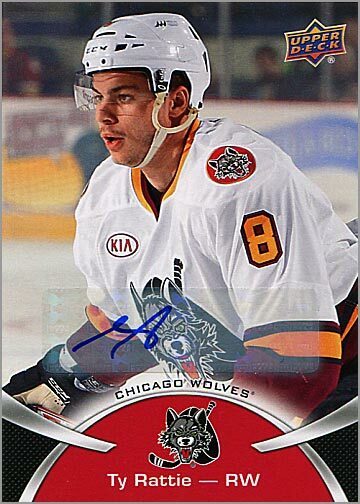 Also, you are so right about those Upper Deck logo tattoos and stickers!